SCOPE: The Health Humanities Learning Lab hosts a regular lineup of Health Humanities-related events and guest speakers at the University of Toronto Scarborough. All events are open to the UTSC community and/or the public unless indicated otherwise. See you there! Stay tuned for announcements about the 2018-19 academic year! March 23 and 24th, 2018. Special event in collaboration with Project Re*Vision’s REDLAB: Digital Storytelling Workshop, UTSC. We are SO EXCITED to be partnering with the University of Guelph’s state-of-the-art mobile media lab to create final projects for students in Prof. Charise’s HLTD50 seminar, “Toronto’s Stories of Health and Illness”. **Please note: this event is limited to students currently enrolled in HLTD50. March 7, 2018. 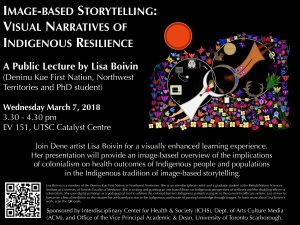 Public lecture by Lisa Boivin (Deninu Kue First Nation, Northwest Territories and PhD student), “Image-based Storytelling:Visual Narratives of Indigenous Resilience.” 3.30 – 4.30 pm, EV 151, UTSC Catalyst Centre. We are delighted to host Lisa Boivin‘s visit to UTSC! In addition to a special visit to HLTD50 “Toronto’s Stories of Health and Illness,” she will be giving a public talk later that afternoon. Co-sponsored by Interdisciplinary Center for Health & Society, Dept. of Arts, Culture, Media, and the Office of the Dean. Open to the public. March 1, 2018. 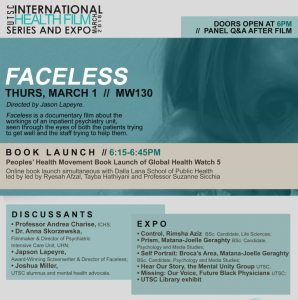 Screening of Faceless, a documentary about the workings of a psychiatry inpatient unit in downtown Toronto as seen through the eyes of current patients. Doors at 6.15 pm, MW 130; screening begins at 7pm). With special guests Dr Anna Skorzewska (physician and filmmaker), Jason Lapeyre (Faceless director and award-winning screenwriter) and Joshua Miller (UTSC Alum and mental health advocate). March 23, 2017. (doors at 6.30pm, MW 130; screening begins at 7pm sharp). Screening of “House Calls”, award-winning documentary featuring Dr. Mark Nowaczynski, a physician who photographs the lives of many of his elderly patients. 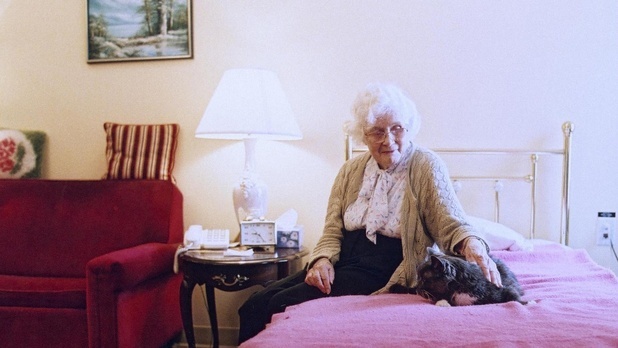 We are really excited to confirm that Dr. Mark will be joining us in person to discuss his work as a physician and photographer of his older patients. This film will be presented as the grand finale to the 2017 International Health Film Festival and Student Expo, an annual event at UTSC. SCOPE is proud to be a part of this incredible programming that features the role of the arts in representing and enabling healthy lives and health-related outcomes. Open to the public; join us! September 19, 2016 (6.30-7.30pm, MW140; doors at 6.15pm): Presentation by Faces of Health Care, a patient advocacy and photojournalism project led by Dr. Andreas Laupacis, Executive Director of the Li Ka Shing Knowledge Institute of St. Michael’s Hospital, Professor in the Faculty of Medicine at the University of Toronto, and founder of HealthyDebate.ca. Dr Laupacis will be joined by physician, filmmaker, and photographer Dr Seema Marwaha (Toronto General Hospital), who is currently working on a documentary about cultural differences that exist in aging and dying outside of North America. March 17, 2016: UTSC International Health Film Festival Screening of The Penelope Project (Theme: Ageing, Health, & the Arts). MW130, 6pm. Discussants: Professor Andrea Charise, Julia Gray (research-based theatre director and playwright, “Cracked: New Light on Dementia“), Samya Hassan (Project Manager, Council of Agencies Serving South Asians) & art exhibit by the Alzheimer’s Society of Toronto. 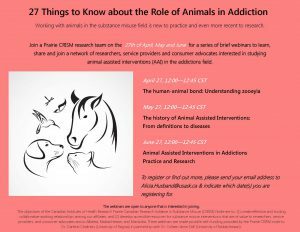 Colleen Anne Dell’s research addresses innovative areas in substance abuse, ranging from horse-assisted therapy for youth in treatment to knowledge translation efforts addressing the role of identity and stigma in the healing journeys of Aboriginal women from substance abuse. Her work has been successfully translated into creative forms such as music videos and community workshops – not to mention, research collaborations and manuscripts co-authored by Anna-Belle Dell, the therapy dog (yes, you read that right). Find out more about the growing body of health research on animal-assisted health interventions. 3.5/4 stars from the Globe and Mail: read the review here. Sign up with Prof. Charise to get your ticket. March 12, 2015: UTSC International Health Film Festival Screening of You’re Looking At Me Like I Live Here and I Don’t (Theme: Ageing, Health, & the Arts). MW130, 6pm. Discussants: Professors Marlene Goldman and Andrea Charise, with geriatrician Dr. Samir Sinha (St Mike’s Hospital). 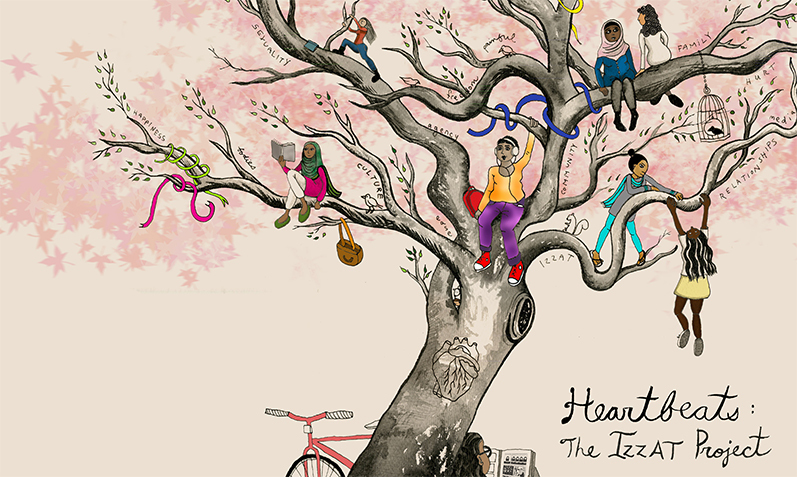 Heartbeats: The IZZAT Project is a Toronto-based expressive arts project in which young South Asian women use illustration, writing and theatre to explore and share community stories about resilience in the face of violence. The book was launched in December 2012 at the Art Gallery of Ontario and has been distributed throughout Canada and now the United States.